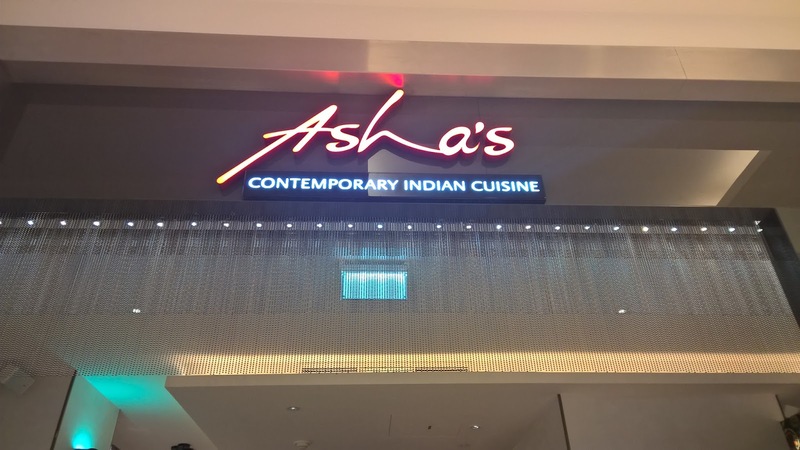 I walk through the mall looking for an Information kiosk, hoping to ask the directions to Asha's. But there is no kiosk in sight. Suddenly, I stop. 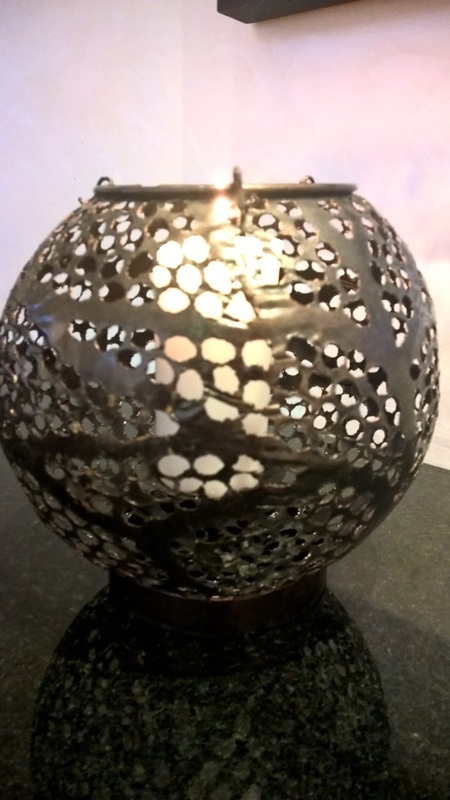 I get the aroma of....it is indefinable, but I know for sure it is good. That must be it, I think to myself. I follow the smell. There it is. Asha's. As I walk in, I reflect on how in a time where food courts have usurped the appreciation for food in a mall, this is indeed a refreshing experience. There is a distinctive song playing. Immediately I ask the manager who it is. Asha Bhosle, a leading light in the Indian entertainment industry for decades and who is the inspiration behind Asha's. Now I write often about the power of first impressions. Well, between the spices and the music, I have had quite a first impression. I am always weary when I hear of celebrities owning restaurants, and I cynically think that they are simply cashing in on their stardom. But as I go through the menu, of course I see some dishes that I simply want to try, but I fall in love with her words. The menu is almost a journal, filled with some insights and context. I am enthralled. I have not even tried her food yet, but I perceive a depth in emotion Asha Ghosle that I now expect to feel in her dishes. 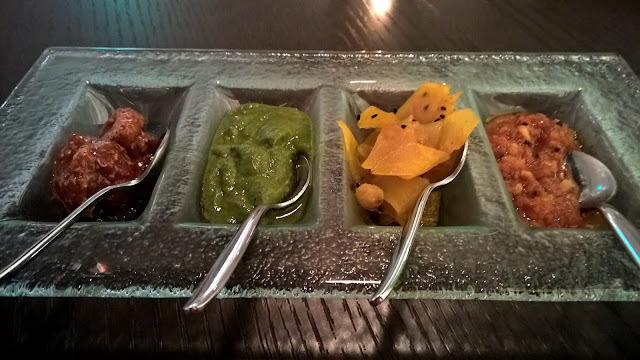 Poppadoms are put on the table, but my attention is drawn to the accompaniments: mint, mixed pickle and tomato chutney are pretty standard, but the papaya chutney is different. I try it. Lovely texture in the papaya and a sweet, spicy savouriness meets my tongue. Nice! 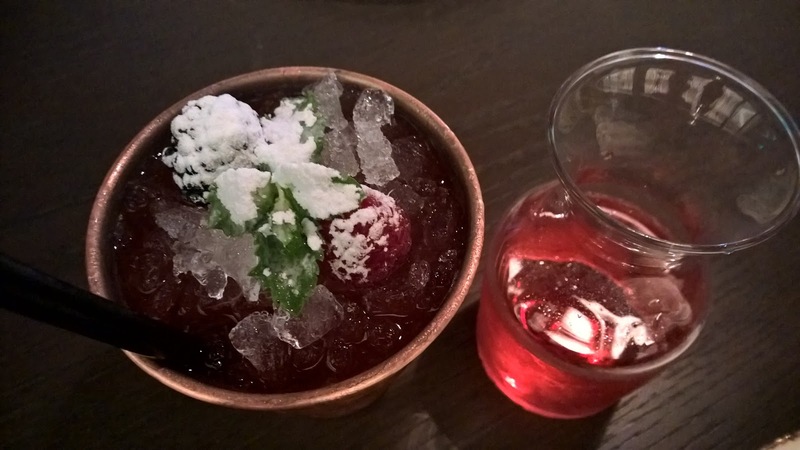 While I am revelling in the flavours of that chutney, I am served one of the creative drinks on the menu - a Delhi Devil. 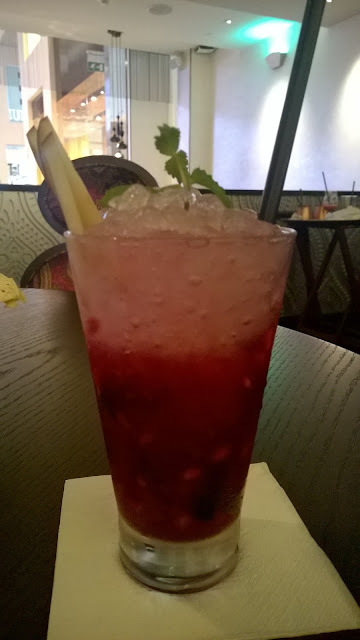 A melange of ginger, grenadine, real pomegranate pieces and lemonade with crushed ice makes for a very refreshing drink. I start off proper with the Dal shorba, a lentil soup. I am taken in by the presentation - Served in a teapot with what could be seen as an espresso cup. It is thick and creamy. First taste reveals coconut flavour, to be followed by a curry taste from the Madras curry powder. Papri on the side that is very addictive thanks to a light coating of curry powder has me reaching for me. 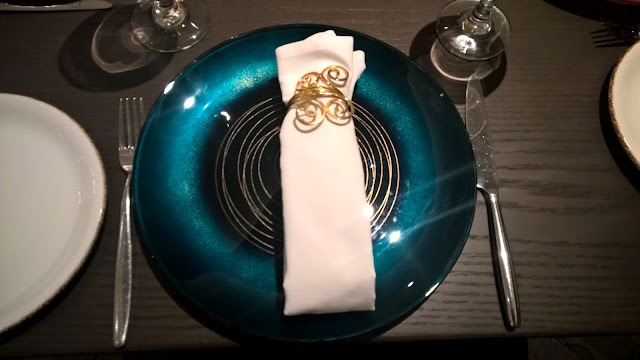 A tasting portion of starters is then served. 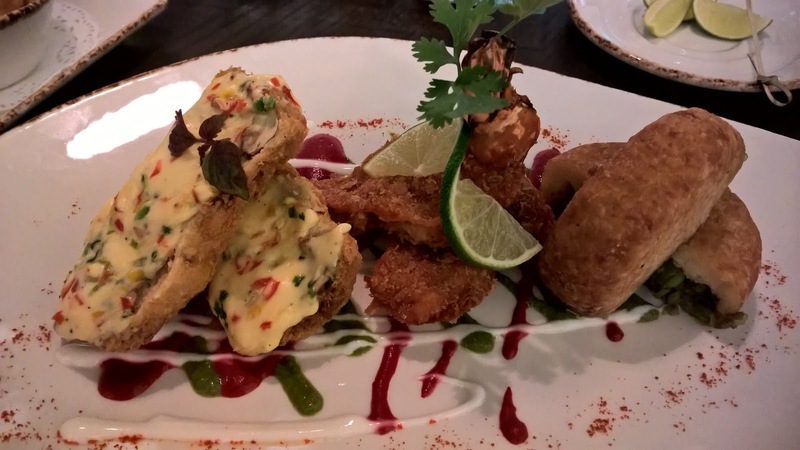 First, I try Mushroom Kurkure, battered and deep fried mushrooms stuffed with bell peppers and seasoned with black pepper. 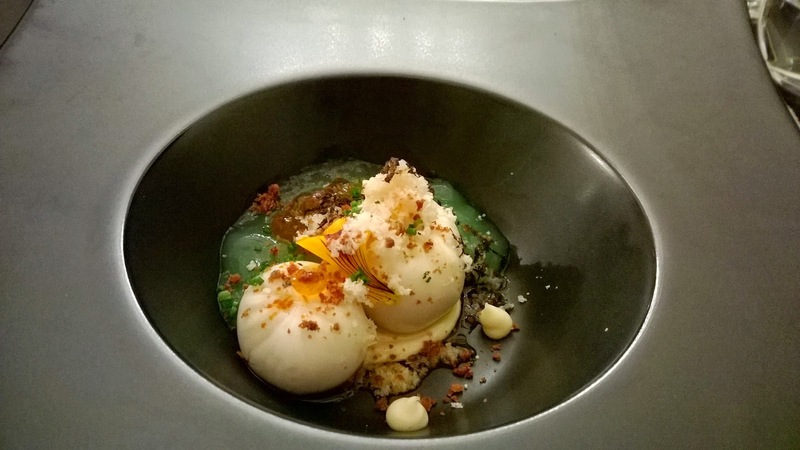 This dish should be used to show anyone who thinks that Indian food is only about heat - it is creamy and textured thanks to Chef Ravi Kumar's use of panko bread crumbs. Following this, I have the Chingri Chaap, flattened prawns also battered and covered in bread crumbs. Ginger and garlic dominate. Delicious. Finally, the most subtly flavoured of all, the Aloo Matar ki tikki. Potato cutlets are stuffed with green peas and lightly spiced up with amongst others, nutmeg. Another winning starter. 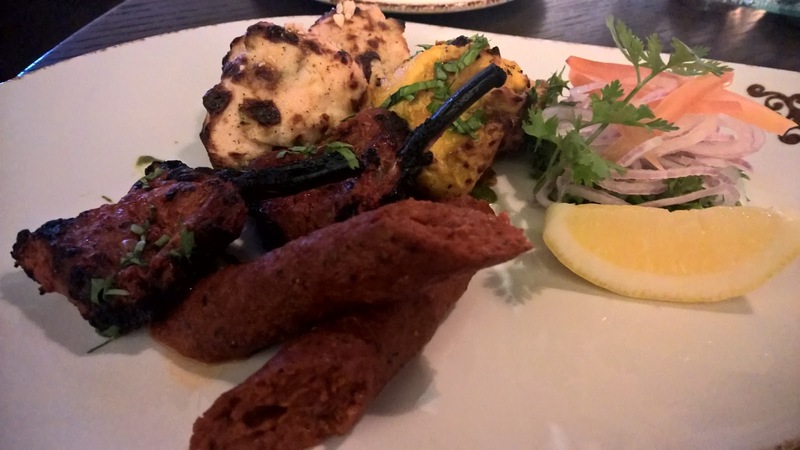 What follows is a platter of a few kebabs. The highlight for me is undoubtedly the Tandoori Murga which is chicken marinated in yellow chili, yoghurt, spices, lemon juice and char-grilled in the tandoor. I love the smokiness of the dish, as much as I appreciate the tenderness of that chicken. Highly recommended. As I wait for my main course, I observe my waiter and notice how naturally he interacts with guests. He connects with a couple of kids at their table, while keeping the other guests informed engaged. This confirms the impression I had of him when he waited on me earlier. Sunil, my waiter, is accomplished, very well spoken and self assured, but with a sense of humility. 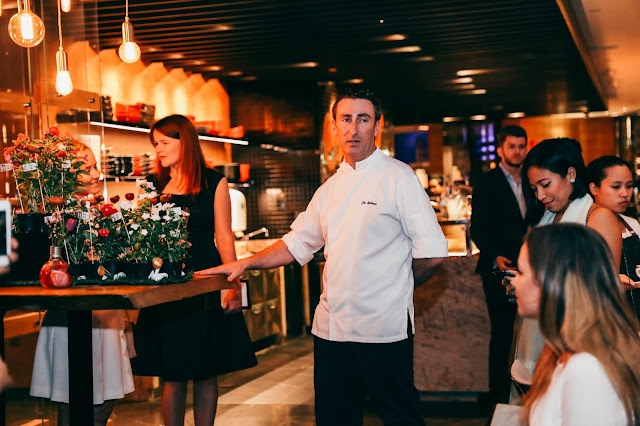 In addition, he really knows the menu and is able to talk effortlessly about the dishes . He is a waiter that would be at home in any 5* establishment in the city. No Indian dinner is complete without the obligatory curry selection. 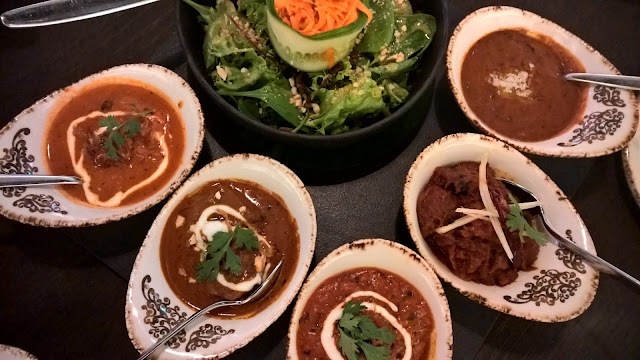 While I find the Murg Makhani (Butter Chicken) and the Chef's Special Dal Makhani rich and creamy but overall what I expected, two curries have me grabbing my pen. The Muscat Gosht, a dish inspired by Asha's trip to Oman, has the most flavoursome brown onion and tomato gravy. As for the Rogan Josh, Boneless lamb curry, the lamb just breaks apart with the least bit of effort. Hints of rosewater comes through with a bit of acidity thanks to the yogurt. However, the best dish is fittingly served last. 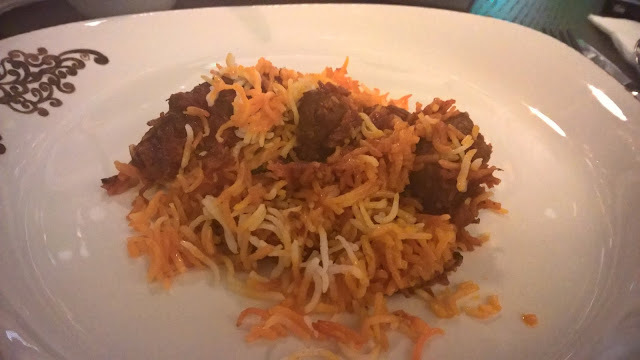 The Kesar Biryani, one of Asha's signature dishes, turns out to be the best Lamb biryanis I have eaten in the city. It has a beautiful colour, is rich in saffron and possesses a moisture about it that makes the the yogurt on the side superfluous. If there is one dish that you try and Asha's, make sure it is this. After that fantastic biryani, dessert seems criminal. I want those flavours to linger, but succumb to the temptation and have a small dessert selection. 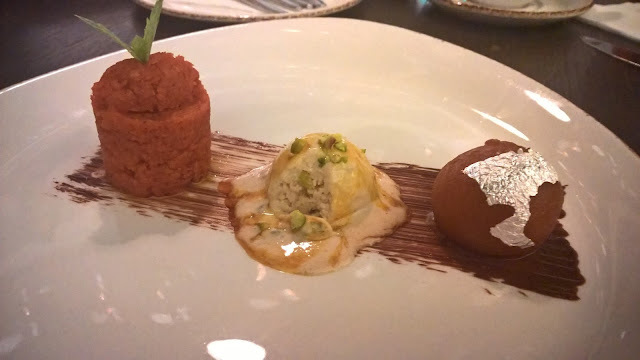 Although the Gulab jamun is too sweet for me, the Carrot halwa and Kulfi with saffron all hit the right note though. Asha's serves sensational dishes. It is that simple. Dish after dish had something very special, and where there were a few typical dishes, it was mostly about surprises on the palate. Over the last couple months I have tried all the high end Indian restaurants in Abu Dhabi, licensed and unlicensed, and Asha's is up there with the best in terms of the flavours of the food - Dishes full of emotion, expectations met and surpassed. And this is the emotion I am talking about. Dishes at Asha'as are more than dishes. They have a lot of heart. A lot. Disclaimer: I consult at restaurants and hotels in an attempt to look at the entire product to take service levels to where they should be. I visited Asha's courtesy of the the restaurant.